This game oozes quirky from every pore. 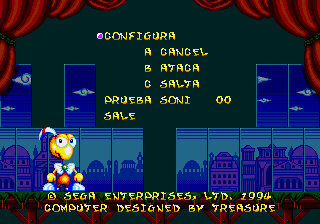 That’s certainly what I took from it after the credits had rolled. 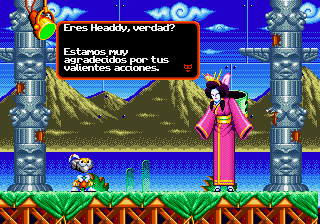 Dynamite Headdy is injected with that nonsensical asian flavour that defies description. You play as Headdy, a puppet who has escaped from the clutches of Dark Demon, with a physique very much like Rayman and it is up to you to defeat him for woefully obvious reasons. Gameplay revolves around shooting your head at things to climb around and beat up enemies with various powerups abound which grant your head different abilities. A credit to the diversity of this game, a series of powerups are used in what amounts to a shoot ‘em up series of levels. Also present is a basketball minigame where you bounce balls into the nets with your head. 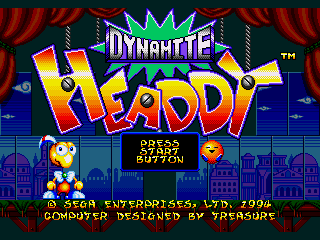 Very tight controls, colourful, whacky presentation, and solid platforming make Dynamite Headdy among my favourite Genesis titles. Rock on. 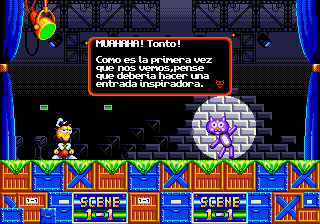 Translation to Spanish for “Dynamite Headdy” for the Sega Genesis/Mega Drive. Based on the English translation by M.I.J.E.T.